Going to the markets in Rome in the spring is intoxicating. While I like cavolo nero, broccoletti and cicoria as much as the next girl, come April I am so over cruciferous anything. But spring brings artichokes, peas, fave and asparagus. And the season is so short for this spring bounty, that I buy and cook as much of them as possible. At the beginning of the season all of these vegetables are hugely expensive. Artichokes can go up to almost 2 euros a piece. 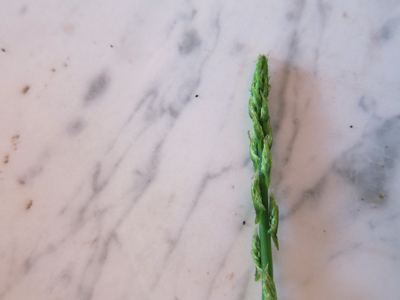 But the most expensive spring vegetable of them all must be tiny wild asparagus. Small, thin stalks, sold in tightly bound bunches, they look more like twigs than the fat cultivated variety. You might think 8 euros a bunch is an awful lot to pay for enough greens that may barely dress a pasta for two. And you’d be right. But you’ve also probably never tried to harvest the little buggers yourself. While I’m happy to buy over-priced artichokes, fave and peas from my fruttivendolo, when it comes to wild asparagus I’ll forage them myself, thank you very much. You see, up in Umbria, around our house, the woods this time of year are full of these beauties. If you can find them, that is. For years I’d see my local neighbors walking along the side of the road, and into the woods, barely able to wrap their hands around huge bunches of hundreds of asparagus. While I, complete with my special asparagus picker, would be holding a sad looking dozen. My neighbors would be looking at the exact same patch of woods that I was, but where they saw (and picked) stalk after stalk, I saw only twigs, weeds and grass. You see, asparagus are very tricky. They stand very still and pretend they aren’t edible. Chameleon-like, they blend in with what ever happens to be next to them in the dappled light of the woods. But I’m happy to say, that after 15 years of serious practice, I’ve finally gotten good enough to at least harvest enough for a meal during a morning’s work. I’ve laid claim to several very isolated patches of underbrush where I know the stalks pop up every year. My friend Jane and I got going this past weekend, and were quite happy with our haul. And if you think our bunch looks impressive, you have to remember that most of the damn things get thrown away. The skinny stems are hard and fibrous, and only the top third of the stalks are actually edible. So, next time you wander into Campo de’ Fiori, and wonder why those wild asparagus are so expensive, just go try to pick them yourself. I may lend you my special asparagus picker. But I’m sure not going to reveal my secret spots in the woods. Clean and trim asparagus, cutting them into 1 inch lengths and discarding the hard and fibrous stems. You can tell what to save and what to throw away by bending the stalk. If they snap easily, that means they are edible. If you bend then and they don’t break, that means you’ve hit the tough part. When in doubt, I bite it with my teeth. The asparagus should be tender enough to bite through, cooked or uncooked. In a frying pan, heat 1 tablespoon of oil, and gently cooked the chopped onions until softened. Don’t let them brown. Add salt and pepper, and the asparagus. Give a good stir, to coat with onions and add a half cup of water. Cover the pan and let gently steam for about 5 minutes. Uncover the pan, and taste to see if tender. Cook until tender, adding more water if necessary. Let the water completely cook away and turn off heat. In a bowl, break eggs and beat with salt, pepper and parmigiano. Add the cheese cubes and cooked asparagus and stir to mix. In the same pan, add the remaining oil, and pour in the egg mixture. Cook on low eat, with the cover on the pan, until the frittata is set. If you can manage it, hold the cover on the pan, using a pot holder, and flip the frittata over, so that it is resting on the lid. Then gently slip it back into the pan to make sure the other side is fully cooked. To serve, gently slip onto a round serving platter. A note on the pan: this is the one time I absolutely insist on using a good non-stick pan. It really does make the whole frittata experience much smoother. You’ll notice my frittata below is less than perfect, and that is because I was using a pan that stuck. Tasted great, but wasn’t as perfect looking as my obsessive compulsive self would have liked.